MANUFACTURER OF THE WORLD'S LARGEST RANGE OF PERFORMANCE BRAKES FOR MOTORCYCLES AND HIGH-PERFORMANCE CARS. Award Winning DUST FREE Kevlar Brake Pads !! Suitable for all fast road applications including hot hatches and fast sedans. This pad features a high Kevlar content formulation resulting in an ultra high performance road pad which is extremely kind to discs. With a friction co-efficient of around 0.46µ and high resistance to brake fade (550º C) this pad is a superb upgrade for high performance street cars, high speed freeway use and consecutive heavy braking. Ideal track day pads. Suitable for light to medium race applications, fast road usage by heavier cars and track day use. EBC's semi-metallic Redstuff formulation is a true asphalt race pad with medium lifetime and a friction level of about 0.3µ steadily rising to 0.33µ at 750ºC. 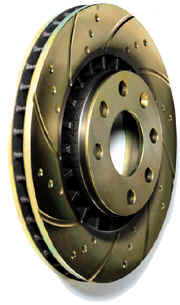 Redstuff is very kind to brake discs and can be used on highway vehicles for extreme duty use as well as on race cars. EBC's flagship race compound. Yellowstuff is EBC's longest lasting full race compound, again exhibiting zero brake disc damage. Yellowstuff has an average friction level of 0.34µ delivering awesome stopping power right up to 900ºC. Yellowstuff was rated best race car brakes by UK's largest circulation motorsport magazine, Max Power, in 1999. Knowing where rotor castings come from, not just where they are machined is a major problem for consumers. There are a wide range of qualities on today's world markets. Not all are equal. 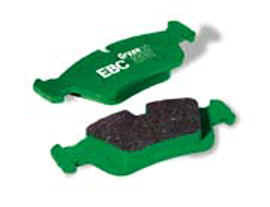 A good quality cast iron rotor, with or without slots or grooves will work well with EBC Greenstuff. Just don't try to buy the cheapest or you may end up with a poor brake or a warped rotor. 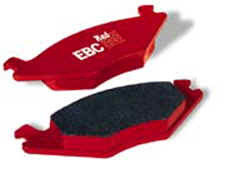 Award-winning EBC Sport brake rotors will stop your car faster, look great and help de-glaze pads under heavy use. "Full Sweep" groove pattern ensures parallel pad wear. "Blind Hole" system reduces chance of rotor cracking around holes. Both grooves and spots (holes) help break down surface gas film developed in heaving braking, reducing brake fade. For more information or to place an order, call the ACTION CENTRE on (08) 92424333 or send us an email.